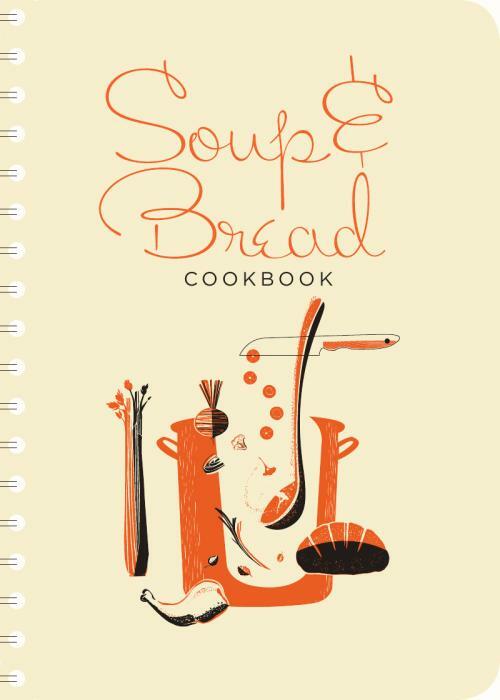 Edited by Martha Bayne and designed by Sheila Sachs, the Soup & Bread Cookbook is a collection of recipes from the 2009 run of Soup and Bread at the Hideout. It’s full of 52 soup recipes and 8 recipes for breads and miscellaneous baked goods, all contributed by local artists, musicians, writers, teachers, firefighters, barflies, and cooks. The book is 124 pages long, and offset printed in two colors, with a letterpress cover and original illustrations by Paul Dolan. Self-published by Martha and Sheila, after a successful fundraising drive, it’s available from the bar at the Hideout; via PayPal (click the cover image up there on the right); in Seattle at the Cathedral Shop at St. Mark’s; and in Chicago at Quimby’s, Renegade Handmade, Green Grocer Chicago, Swim Cafe, Chicago’s Downtown Farmstand, Jayson Home and Garden, Women and Children First, and the Sweden Shop. A portion of the proceeds from all sales of the Soup & Bread Cookbook are donated to the Greater Chicago Food Depository. For more information contact Martha at soupnbread10@gmail.com. how much does this cookbook cost? Thanks!